From 124 planes in December, Jet is now operating just 6 ATR turboprop planes and one Boeing 737. 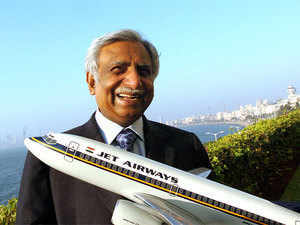 MUMBAI: A Delaware entity, Future Trend Capital, is understood to be backing the offer by Naresh Goyal’s Jetair to invest in Jet Airways, the distressed airline that is facing a severe cash crunch, employee anger over delayed salaries and grounded planes. The Jetair spokesman had not responded till press time to ET’s emailed queries on Goyal’s connection with Future Trend and the delay in submitting the EoI.